Deadman’s curve and the Pratt Oil Works, in today’s post. Normally, one would not be seen marching along the LIRR tracks in Blissville, but I had my reasons. It was a Sunday afternoon, anyway, meaning that the chances of there being any rail traffic at all on the Lower Montauk would be slim to none so I decided that it would be a good time to throw the dice and hope that I wouldn’t get squished by a passing locomotive. There’s plenty of places to dive out of the way, if I were able to discern an approaching train, but that’s kind of the issue – trains move pretty quickly and the physics of how sound moves around the air dam created by the engine as it’s moving seriously reduce the “early warning” time. Saying all that, I didn’t get squished, but do not recommend you chance it yourself. It is illegal trespass, after all. Me, I was scoping out the latest wrinkle in the environmental story around the fabled Newtown Creek. I went to a meeting a couple of weeks ago at the NYS DEC offices in Long Island City, which discussed the “Pratt Oil Works Site” or as I’ve been referring to it for several years – “The Queens County Oil Works of Charles Pratt” or alternatively “The Blissville Seep.” ExxonMobil has taken responsibility for the site, which ultimately used to belong to its corporate parent Standard Oil, and has (under DEC guidance) begun the process of siphoning “product” out of the ground. Said product, the ExxonMobil folks said, is distinct from the liquid product which has been oozing from the Creek side bulkheads into the water. 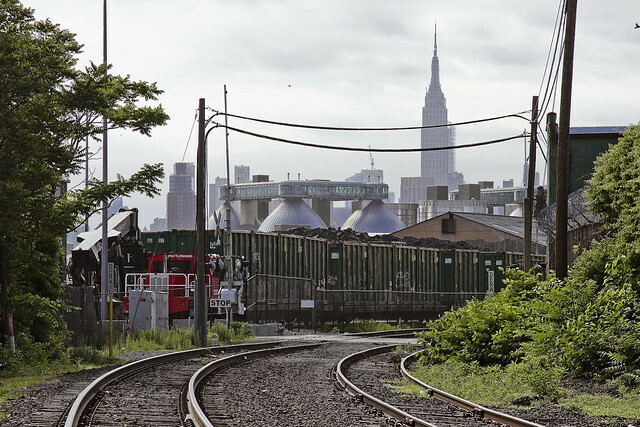 The modern day owner of the site is largely the Waste Management company, which operates a waste transfer station along Railroad Avenue that handles DSNY collections and loads up the Garbage Train. Said garbage train provides framing in the shot above. The Queens County Oil Works was in operation from 1842-1949, whereupon the property was subdivided and sold off. ExxonMobil representatives described the materials their contractor Roux will siphoning out of the ground as “Lube Oil and wax” and the petroleum product oozing into the Creek as “LNAPL” or Light Non-Aqueous Phase Liquid. LNAPL is lighter than water and floats on top of ground water. 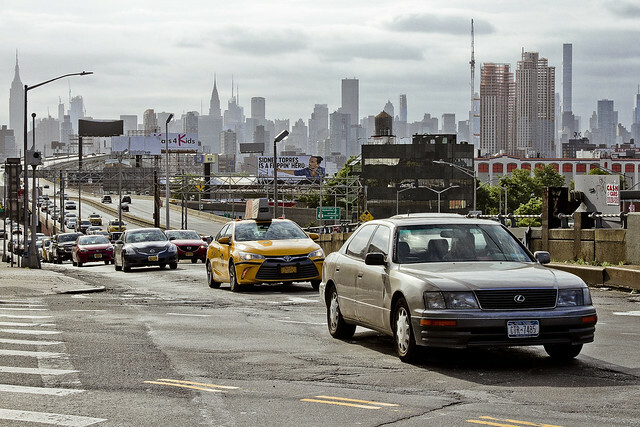 ExxonMobil’s contractors, Roux Associates, who handle the Greenpoint Oil Spill for them directly across the Newtown Creek in Greenpoint, has been activated to handle the Blissville situation. Roux has installed 62 wells on the property, 42 of which are recovery wells and the other 20 are monitoring wells. Waste Management, separately, has several issues they’re dealing with on the site, including a high level of acidity in the soil and the presence of toxic chemicals – specifically Toluene and Chlorinated Volatile Organic Compounds. Waste Management will be aerosolizing these chemicals, meaning that they will be using a process called “SPARGing” which will release them into the open air. ExxonMobil representatives were cagey about the quantity of “product” in the ground, even after I confronted them about specifics. Saying that, I’m certain they know exactly what’s down there, as engineers who have installed 62 wells don’t just do so randomly and hope for the best. 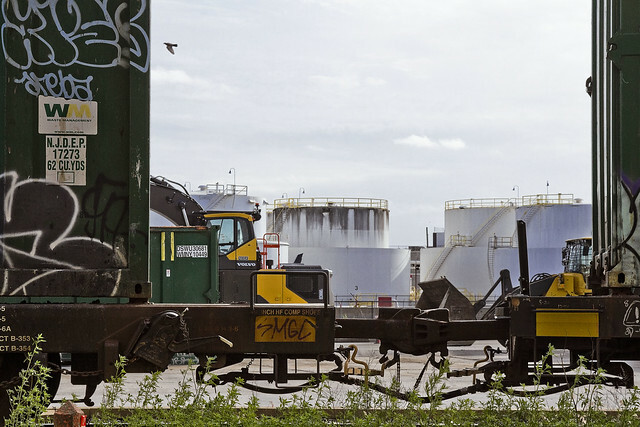 Waste Management claimed that their timeline for remediation of both the soil ph conditions and the presence of “chemicals of concern” would be four to eight years, whereas the ExxonMobil folks said it’s an open process and wouldn’t commit to a timeline. Oddly enough, a review of the combined project’s boundaries corresponds neatly to the property lines of the former Queens County Oil works. Luckily for Blissville, here in Queens, subterranean oil deposits respect above ground political and property lines. If you are technically minded, or just curious enough to “get it straight from the horse’s mouth,” follow this link for the NYS DEC fact sheet. Generally if the basic definition is to be believed the last step before the process of air-sparging is complete is treating the vapor before release into open-air, with some form of activated carbon. One hopes, anyway.